Matho Monastery is near the Indus River bank and around 26km away from Leh. It is a Tibetan Buddhist monastery built under the Saskya Monastic Establishment by Lama Dugpa Dorje in 1410. The Matho village, which starts from Zanskar range and go across the Indus is situated at the deep gorge. This monastery is parallel to the Thiksey monastery. 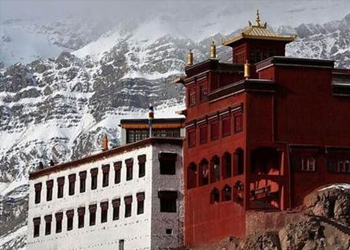 This monastery belongs to the Tibetan Buddhist’s Sakya order. This monastery is mostly famous for the 400 years old Thangkas and its famous Nagrang festival, when ritualistic dances are performed here. Falling on the 14th and 15th day of the first month of Tibetan calendar, this festival is celebrated to mark the visit of two Gods (Rongtsan) to this shrine. The annual festival of oracles is celebrated in 1st half of March at Buddhist New Year. There is an increase in the number of monks who reside inside the monastery. The assembly hall has paintings of Lords of Quarters. A small chapel at the top of the building has an image of Sakya Pandit and other Sakya lamas. The museum near the chapel contains the old Thangkas of 16th century which were brought from Tibet.